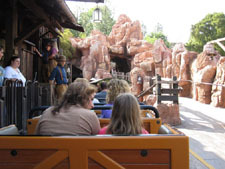 Classic Disney rides: a must for your Disneyland vacation! Should you get a Season Pass? Disneyland is open every single day. You could even spend your Christmas there if you wanted to (but keep reading to see why you may not want to). The fact is, there really is no "bad" time to go on a Disneyland vacation! 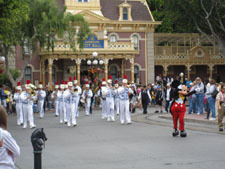 Disneyland is the most crowded in the summer, particularly July and August. The Park are also really crowded during school holidays, every weekend, and Christmas. Despite the fact that it will be crowded, it's still nice to go to the Park during the summer because it will be hot enough to enjoy all of the water rides. Also, thanks to longer days in the summertime, you'll be able to enjoy the Disneyland's extended hours, which last from 8 am to 11 or 12 pm, depending on the day. So, if you're going to take your Disneyland vacation during the summer, I recommend visiting the Park between Tuesdays and Thursdays. Not only will the Park be less crowded then, but you'll likely be able to get cheaper room rates at wherever you stay. Visiting Disneyland in the winter is another story altogether. Winter in southern California is anything but predictable. I have experienced 90 degree days in January, two Januaries in a row. Or it could be raining for the whole week. That's how rain works in southern California because it is a desert climate zone. It will rain for a solid week and then be dry as dust for the next five months. Or five years. Winter also means shorter days, and therefore shorter Park hours. But, because the Park will be less crowded, you could theoretically enjoy the same number of rides on a short-line winter day as a long-line summer day. I think the worst part of going to the Park in the winter if that, unless it's one of those freak 90 degree January days, you won't want to go on any of the water rides. And the water rides are AWESOME. The BEST thing about going taking your Disneyland vacation in the winter is that a few rides are redone for Christmas! A nice compromise is to take your Disneyland vacation in Spring or Fall. You'll find the Park less crowded than summer, but warmer than winter, plus your accommodations are likely to be less expensive than in the summer. This option works best if you A) don't have kids, B) your kids aren't in school yet, or C) you homeschool your kids and can do whatever you want whenever you please! It's easier than you think. There's no "limited time offer" or "special promotion" involved in getting cheap Disneyland tickets. Click on this link now to see how I get cheap Disneyland tickets. 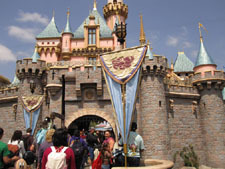 There are MANY places to stay for your Disneyland vacation, both right at Disneyland, and in the vincinity. 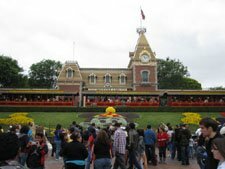 If you're interested in apartment-style accommodations, consider renting one of my two Disneyland timeshares, both located about a mile from the Park. You will be on your feet all day, unless you are renting a wheelchair. I remember seeing a special on TV once on the history of Disneyland, and about how they used a special kind of asphalt to make walking more comfortable, but, just the same, make sure you bring comfortable broken-in walking shoes that really cushion your feet. Don't wear your favorite outfit; you might get stains on it. You're going to be getting in and out of rides, so be sure to wear loose, comfortable clothing. If you take your Disneyland vacation during the winter, dress in layers. In most cases, having a sweatshirt or a windbreaker that you can tie around your waist will work just fine. Be sure to check weather.com in the morning before you head out to the park so that you know what to expect. No matter when you take your Disneyland vacation, bring sun screen. Disneyland charges different rates for parking depending on the size of your vehicle. It costs $15 to park a car or a motorcycle for the day; $20 for "oversize vehicles," motorhomes, RVs, and tractors (minus the trailer); and $25 to park buses and tractor-trailers. Read my full article on the parking situation at Disneyland (and why you may want to avoid using the parking structure tram). Yes, you can bring your cat or dog with you on your Disneyland vacation! Unfortunately (fortunately?) they will not be able to go on any of the rides with you, or even walk around the Park. Disneyland has a Kennel Club where you can board your pet for the day. Read my full article about bringing pets to Disneyland. When I was a child, the lockers cost one quarter per use. Now there are five sizes of lockers, with a per/day price for each. Depending on what size locker you get, your per/day price will range between $7 and $15. Officially, the rule is that no food or beverages are allowed into either Disneyland or California, unless you have specific dietary restrictions. Disneyland didn't always have this no-outside-food rule. When I was a little girl, we could bring in a cooler full of food and stash it in one of the inside-the-park lockers. Unfortunately, the after-effects of 9/11 do not go away even during a Disneyland vacation. Security does check purses and backpacks upon entry. However, if you are discreet, you will have no problem bringing in bottled water and small snacks. You should be able to hide a couple of snack bars in your purse under all of your purse stuff, or at the bottom of a backpack underneath a sweatshirt. If you'd like to bring actual meals with you to avoid the higher prices of Disneyland fare, they do have a set of lockers just outside Disneyland's Main Entrance where you can store your food. Just adjacent to the lockers is the Picnic Area. People are crazy about Disney's turkey legs, which you can buy from a few different food carts around Disneyland. I remember the first time I saw it, just as I got off Big Thunder Railroad, I said to my friend, "Is that a...turkey leg that guy is eating? It's huge!" And then I saw the food cart. It smelled soooo good. It's been my personal tradition since I was eight years old to get a frozen banana every time I go to Disneyland. What I've noticed the last couple of times that I've gone though is that the bananas are frozen SOLID. It's kind of annoying having to carry a rock-hard frozen banana around while it defrosts, especially on a hot day because I'm always afraid that the chocolate will melt off before the banana's soft enough to eat. What's YOUR favorite food cart at Disneyland? I LOVE pretzels, but watch out for the Mickey-shaped pretzels from the pretzel cart. They're not as soft as you'd hope them to be. They're more cute than they are tasty. The Gibson Ice cream parlor next door to the Blue Ribbon Bakery has the best ice cream in the park. "We stopped by the Blue Ribbon Bakery upon arrival at Disneyland to get a cinnamon roll to start the day off and returned later to get a holiday brownie, which both were delicious. The cinnamon roll could have been heated a bit longer though. Many people swear by Disneyland's corn dogs, calling them the absolute BEST they've ever had. Even if you normally don't like hot dogs or corn dogs, please do give them a try. You'll find them for sale at a little corn dog stand off to your right as soon as you enter Disneyland, as well as at the restaurant between Pirates of the Caribbean and Big Thunder Mountain. Disney's churros and Dole whip get the same rave reviews: delicious! The Blue Bayou is one of the best places to eat at Disneyland, and consequently has one of the longest lines. You don't want to wait that long to eat, so be sure to make reservations ahead of time. 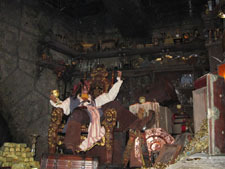 It overlooks the Pirates of the Caribbean and is a must for your Disneyland vacation. What's YOUR favorite place to eat at Disneyland? Food at Disneyland is pricey. If you'd rather not eat at one of the Disneyland restaurants, simply get your hand stamped, and venture over to Downtown Disney or to one of the nearby restaurants at lunchtime. There are quite a few restaurants that are an easy walking distance from Disneyland. If you want more options, you can take a shuttle to the Gardenway Mall (click here to see retaurants near Anaheim's Gardenway Mall). The worst thing about Disneyland is that every ride has a long line. If you're only visiting for a day, you have to plan your day in order to make the most of your Disneyland vacation. The best thing you can to is to take your Disneyland vacation off season, meaning anytime but summer, Christmas, weekends, or school holidays. Planning the perfect Disneyland vacation of a lifetime? Click here to learn which Disney guidebook you should read. If you can take your Disneyland vacation during the week, so much the better. If you're not interested in going on any water rides, you might even consider the somewhat drastic strategy of going taking your Disneyland vacation on a day that you know will be cold and drizzly. Thankfully, there are other strategies to help you make the most of your Disneyland vacation by helping you enjoy summertime shorter wait times too. Download the iPhone app "MouseWait." It tells you the wait times at most of the rides. If you see that one of your favorite rides suddenly has a short-ish wait time, head on over! You should also have a FastPass strategy to make sure that you get on the most popular rides. Though the shops will be more crowded in the evening, this really is the best time to do your "big" shopping, since you don't want to have to carry lots of stuff around with you all day. This advice can be a little tricky to carry out though, since most rides exit through their own gift shops. With Disneyland's high prices, you may be surprised to learn that you can get some souvenirs FOR FREE! Another great idea is to purchase your Disney souvenirs before you even leave for your Disneyland vacation from a Disney store at your local mall, or even through ebay. 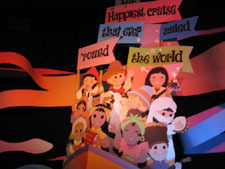 Yes, the dolls are kind of...creepy, but who can resist riding the slow boat through It's A Small World to be mesmerized with this 50's utopia of world peace? Big Thunder Mountain Railroad is one of my favorite roller coasters of all times, and I think this is because it's not like a lot of roller coasters: it's really thrilling and exciting without being ridiculous (you know what I mean - there are some roller coasters out there that drop you head first 300 stories at 1,000 miles per hour and you can't help but feel that you could possibly die). Big Thunder is just plain fun! Peter Pan's Flight is a delightful ride. I love the part where it looks as though you're flying far above London. It's amazing how many rides make me feel like a little kids. Of all the rides, I think Mad Hatter's Tea Party (aka "The Teacups") does the trick the fastest. 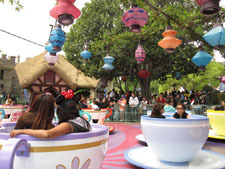 Aside from the rocketship ride and the Dumbo ride, the Teacups is one of the few "interactive" rides at Disneyland. The center of a teacup has a wheel that you have to spin to make your teacup spin around. Yes, there are a few people who like to just "enjoy the ride" without spinning their teacup at all, but whenever we go, we try to make ourselves spin around as fast as possible. Mr. Toad's Wild Ride has always been one of my favorites, and I have no rational explaination as to why. I love screaming throughout the ride the same way that most people scream during Space Mountain and Matterhorn. 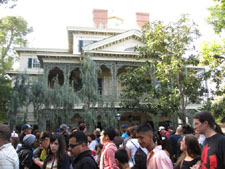 The Haunted Mansion is a classic that you absolutely must ride. I've ridden it dozens of times but it never gets old. Around Christmas time they turn the Haunted Mansion into a Nightmare Before Christmas ride. I was actually tall enough to ride Space Mountain on my third birthday. I don't remember that day at all, but my parents told me that I spent the entire ride screaming, "Mommy! Daddy! Mommy! Daddy!" Now it's my favorite ride. It's basically a super fast roller coaster in the dark. 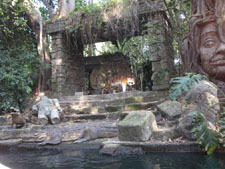 I've always loved the campy Jungle Cruise, with all of the animatronic hippos, alligators, and elephants. One of my favorite not-a-rides has always been the Swiss Family Robinson Treehouse (I LOVE that movie!). The treehouse rooms were filled with the Robinson Family's artifacts. I always felt that I was an archeologist, discovering someone's castaway life. However, when I visited Disneyland a few years ago I found that they had turned it into Tarzan's Treehouse. 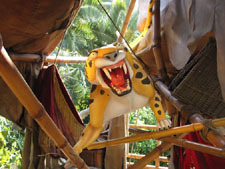 Inside of delightful historic-looking artifacts, the rooms are now filled with colorful plastic cartoony Tarzan things. Still cool, but in a different way. What's YOUR Favorite? Everybody has a favorite ride at What's yours? If you live in the area and want to prolong your Disneyland vacation indefinitely, the simple anser is YES!!!!!! Your Season Pass gets you into both Disneyland and California Adventure for a whole year, though there are some blackout dates (unless you get a Premium Season Pass). Why else should you consider a Premium Season Pass? FREE PARKING! Both the regular Season Pass and the Premium Season Pass will get you discounts at most restaurants at both Disneyland and California Adventure, in Downtown Disney, and even some of the restaurants at Gardenwalk. It pays for itself in three visits. That means if you went once a week, like some local Disney fans do, visits four through fifty-two are essentially free! I think the best thing about having a Season Pass is it takes the pressure off about trying to get your money's worth. When you just go for one day, you feel a lot of pressure to pack your entire Disneyland vacation into that one day. If you've got a good FastPass strategy, then yes, this can be done. Otherwise, there is no way that you can "do everything" in one day. With a Fast Pass, you can go to Disneyland and just go on Space Mountain, then Indiana Jones, have a corn dog, and call it a day, and not feel guilty about not having done "everything." Or you could go to Disneyland just to have dinner and watch the fireworks and be done. Why get a Disneyland timeshare rental? Because you've been planning your Disneyland vacation for a long time. You want everything to be perfect. Why ruin it by stuffing everybody into a little hotel room when you can get an apartment-sized timeshare rental? I have two timeshares for rent in Anaheim. Dolphin's Cove is about a mile-ish from Disneyland, but tends to fill up FAR in advance, as you can imagine. Another option is WorldMark Anaheim, which is also about a mile-ish from Disneyland. This is my most popular timeshare rental, so, even though it also fills up fast, it does have better availability than Dolphin's Cove.